Buescher was one of the two big names in American bass saxophones. The majority of American basses were keyed from low Bb to high Eb, and were built during the saxophone’s heyday of the roaring 20s. Once the Great Depression hit these behemoths became almost obsolete, and it would take nearly 80 years before we would see the bass saxophone renaissance of today. Buescher bass saxes were almost always True Tone models, and even when they weren’t stamped True Tone, they were still based on the True Tone design. According to saxophone historian Pete Hales,¹ this was because Buescher never designed an Aristocrat or 400 model bass. …if you wanted a bass in 1950, say, Buescher would trot out the old True Tone molds and make you one, generally with different engraving and sometimes with slightly different keywork, such as a redesigned G# cluster. Extended keywork ranges are NOT found, though. In other words, even if you ordered an Aristocrat bass, it would only be keyed to high Eb. 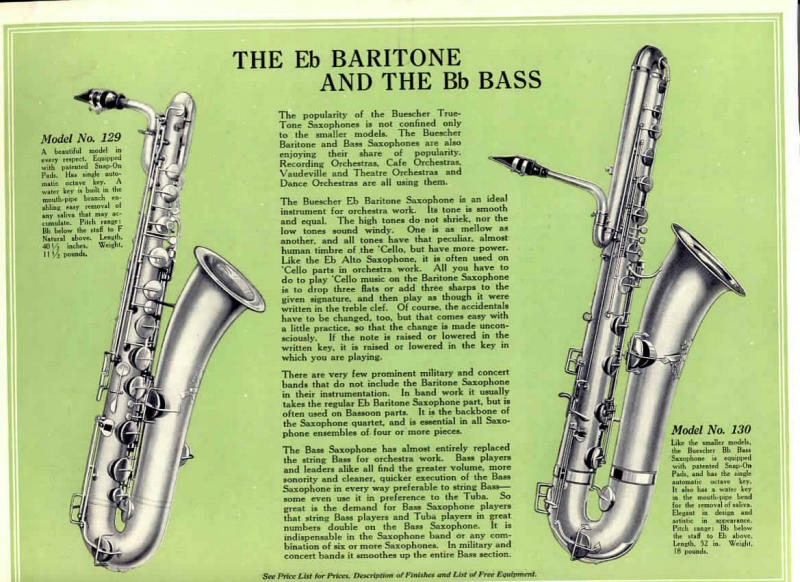 The advertising copy for the Buescher True Tone bass from this vintage ad is interesting, because it gives us some insight into how the sax was perceived at the time. The Bass Saxophone has almost entirely replaced the string Bass for orchestra work. Bass players and leader alike all find the greater volume, more sonority and cleaner, quicker execution of the Bass Saxophone in every way preferable to string Bass—some even use it in preference to the Tuba. So great is the demand for Bass Saxophone players that string Bass players and Tuba players in great numbers double on the Bass Saxophone. It is indispensable in the Saxophone band or any combination of six or more Saxophones. In military and concert bands it smoothes up the entire Bass section. Like the smaller models, the Buescher Bb Bass Saxophone is equipped with pateneted Snap-On Pads, and has the single automatic octave key. It also has a water key in the mouth-pipe bend for the removal of saliva. Elegant in design and artistic in appearance. Pitch range: Bb below the staff to Eb above. Length, 52 in. Weight, 18 pounds. I put together a gallery of some of the prettiest Buescher True Tone bass saxophones that I have come across. And because mine is definitely not among the prettiest, I have not included it in the gallery, but it is here, in the gear section of my site.